Swot is up with that? I don’t know for sure what the mark of a really good analyzer is, but I know with the mark of a bad one is, and that’s making things more complicated than they need to be. The SWOT is a great example. Matrices are great for analyzing data, but can be dangerous when giving birth to ideas. The evidence against the SWOT is pretty clear. But that should not stop you from enjoying what does work in a Matrix Diagram. ​A matrix is a tool for analyzing data. In math, a matrix is a rectangular array of quantities or expressions in rows and columns that is treated as a single entity and manipulated according to particular rules. But for our purposes, a matrix chart is a simple visual tool that helps you understand and relate different things based upon agreed-upon rules. The most popular for those in the corporate business school set is the SWOT, but I won't show you that. So WOTS in it for You? ​How do you deal with problems like, what new item to produce and market? What is the process a restaurant uses for deciding which items to take off the menu, and which to put on, and how do they come to grips ahead of time with the effect that will have on their purchasing, workload, and profitability; not to mention making their customers happy. It is used to look at different strategies for growing markets, for instance square one would be ways to grow your existing product in todays market, square two would be a new product in an existing market, etc. While I don’t fully support expending a lot of time filling one in, since it would all be hypothetical, and could be a waste of resources, it does present the challenge of new product development and positioning quickly and clearly, don’t you think? 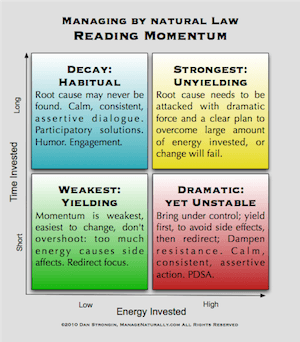 ​And here’s the example from a previous post of the momentum matrix, or a tool that helps you visualize just how much force you should be applying to particular problem based on time invested in the problem being the way it is and the amount of energy invested. The point is not to dictate a reaction, or treat the tool like scripture and follow it letter and verse, but to use as an easily understood, quickly followed guideline to better grasp the underlying situation in order to try different things, and see what works. Now if these examples seem a little heady to you you are right. The matrix works well in planning and analyzing, which are heady things to do. 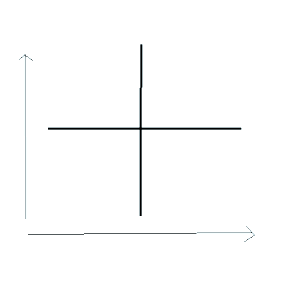 Draw a second line, vertically, that crosses the center of the first. 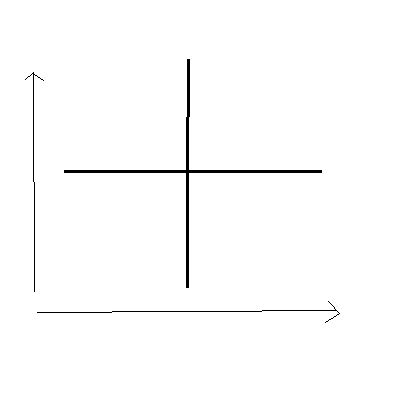 You should now have 4 “quadrants” and two directions, both starting at the lower left corner of the diagram. Now draw two arrows as in the image, and decide what each “arrow” means. Start filling in the data. When it is ready, I just snap a pic with my iphone. I like to do these on a white board, or on the wall, or on a table top, using post-its for the data points so I can move them around within the quadrants as the analysis deepens. Looking at it naked, as it were, what do you think the arrows should represent? Time? Cost? Manpower? Anything that appears to increase sequentially? All of the above and more? Have you used one before? If so, share it in the comments! If not, take a hack at it and share. We can be anonymous here, all you have to do is change your username! an item with a low price and high volume, lower right. And of course, the gold standard, items with high price and high volume. Use profit instead of price, and that may give you some insight into how to develop new menu items that may give you more profit and a good volume. It will also help you see very quickly which menu items you might want to replace. 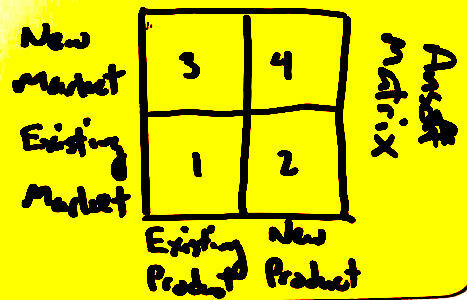 Can you think of any problems you might get some insight into from using a matrix diagram? SHARE!